Good morning, friends. 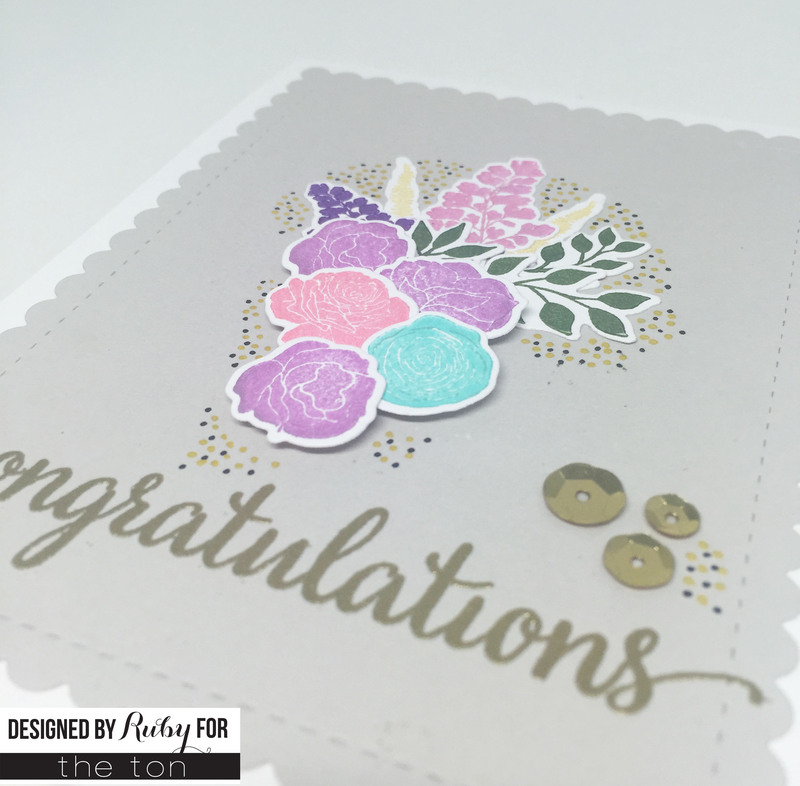 Today’s post highlights the Mini Wild Florals coordinating dies that are available for pre-order right now. I was so excited to received these dies since it goes with one of my favorite stamp sets. I love creating little bouquets with it, and like many people, I don’t mask often for one-layer cards. The dies are helpful so I don’t have to fussy cut anymore. I kept it pretty simple and you can easily create a gift set for friends. Since I know a lot of people who are getting married or have other amazing things going on in their lives, I wanted to wish them well and uplift them. 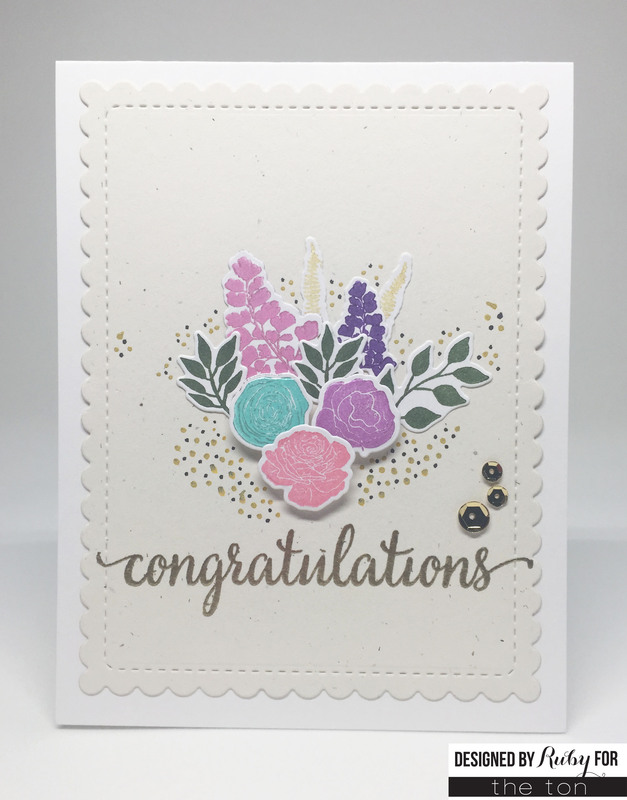 I stamped the florals and foliage from Mini Wild Florals using various Brilliance pigment inks and then die-cut them all. These inks are so awesome because they are pearlescent. I had some 4″ x 5.25″ scallop border pieces in different neutral colors that I glued to size A2 white card bases. I arranged the die-cuts in a bouquet look and glued the foliage with Glossy Accents and the florals with foam tape for dimension. The sentiments were stamped with VersaMark ink and heat set with gold or white embossing powders. 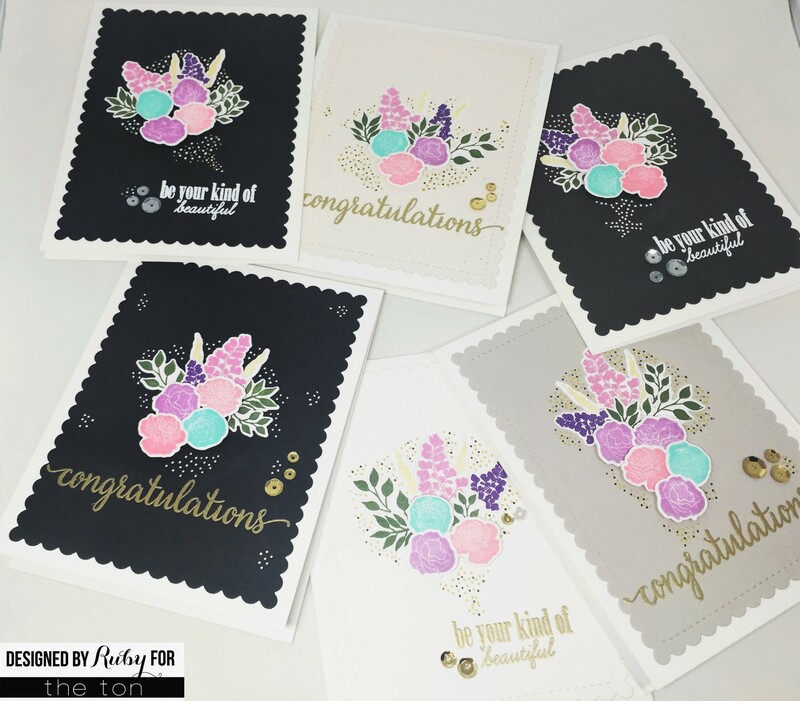 I decided to fill in the ‘bouquets’ with dots using Kirarina glitter markers in white, gold, and black and finished off the cards with some sequins in Medallion Gold and Glass Slippers. Each of the design team members is using a stamp from the new release, and I wonder if you can tell what’s new in my cards. Thanks so much for stopping by. I hope you are as excited for our Fall 2015 release as all of us are, and we have many amazing guests who will be hopping with us on Friday, September 4! There are MANY prizes to be won so please mark your calendars and be sure to join us. Have a great week! Dear Ruby, these cards are so beautiful! Thank you for sharing them! ooohhh…where is that Congratulations stamp from? It’s gorgeous! Oh wow these are stunning! Love the dots in the backgrounds and colors! Look at this beauty Ruby made for The Season! Such a beautiful set of cards and would make such a lovely gift, TFS! Such a beautiful set of notecards!! Love the little bouquet and the great sentiments! !